The French prime minister has presented British playwright Harold Pinter with one of his country's highest awards, the Legion D'Honneur. Dominique de Villepin gave the award at a ceremony at the French embassy in London, shortly after holding talks with Tony Blair. Mr Pinter, awarded the 2005 Nobel Prize for Literature, is widely regarded as the UK's greatest living playwright. He is also well-known as an outspoken critic of US and UK foreign policy. He has spoken out strongly against the war in Iraq and once labelled Mr Blair a "deluded idiot". At the ceremony, Mr de Villepin praised Mr Pinter's poem American Football. 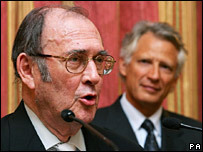 Mr Pinter in return praised France for its opposition to the war in Iraq. His plays include The Birthday Party and Betrayal, and he has also written poetry and prose. He was diagnosed with cancer of the oesophagus in 2002, but continued to write poetry and speak out on political issues. The BBC's Lawrence Pollard says the award for the great playwright underlines how much Mr Pinter is admired in countries like France as a model of the uncompromising radical intellectual.